Kabanov, sometimes called a man-Orchestra. To do this, there seems to be two reasons. One - a large collection of various musical instruments from the sitar and dulcimer to the duduk and remote, in which he played an equally skillful. And this collection is constantly growing - especially that part of it is developing tools, upgrading, and the master of himself. Other - wide range of musical interests, which includes the European Middle Ages, and the eastern tradition, and Slavic ethnic, from jazz to folk-rock and world music. 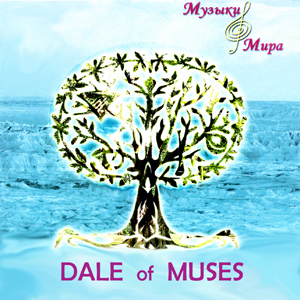 The album "Dale of the Muses" and became, in effect, Ukrainian project in the field of world music - and, apparently, one of the first in Ukraine. Describe this music has no meaning, it must listen to - and it's worth listening to. Not only because it is - for the first time. But because it is - it is beautiful and amazing. It is amazing and gratifying to hear how organically sound together, for example, lyre, deep Ukrainian violin - and Indian percussion. Or mandolin with drymba - Why not a couple? Here you will find unexpected combinations and each of them again and again will say that it - really music without borders, music for people, for everyone, regardless of nationality. Kabanov definitely not mistaken, started looking in that direction - there are many hidden gems that are worth finding. Immediate download of 9-track album in your choice of MP3 320, FLAC, or just about any other format you could possibly desire.